...It Doesn't Come Any Easier Than This! Are you an affiliate marketer... or someone who wants to get started in affiliate marketing? Affiliate marketing really is a GREAT way to make money online. Someone else creates a product and sets up a website to sell it. You, as the affiliate, promote that website and send traffic to it through your own unique link. 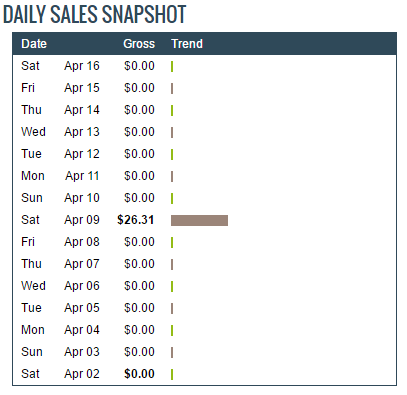 If any of the visitors you send buy the product, you get paid the commission. So Why The Survival Niche? There are 3.7 million people in the US alone who participate in survival and doomsday prepping in one form or another. They spend billions of dollars every year on this. On average, every one of these 3.7 million people spend $400 per year, making this obsessive hobby for them a massive opportunity for you. 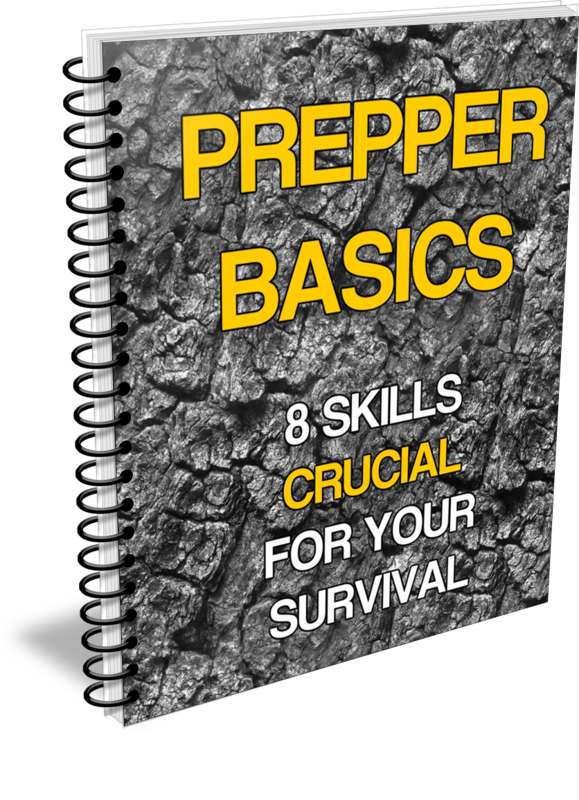 "As many as 3.7 million Americans are classified as preppers or survivalists. Being a "doomsday prepper" is not easy -- or cheap. These people prepare for different disasters for different reasons. Most think that natural, financial or other disasters will destroy our infrastructure or tear society apart. Whether they prepare for long or short-term emergencies, at the very least survivalists plan to have the basic necessities: food, clothing and shelter. Many prepare for much more than the basics with self-defense and security measures, power systems, water filtration, communications and bunkers. Given their numbers and their willingness to spend money, catering to doomsday preppers has become a multibillion dollar business." Of course, for many, survivalism is NOT just a hobby, it's much, much more than that. Their very survival (and that of their families) depends on preparing for the future... which of course means spending money on survival training, survival gear, self defense... the list goes on. The holy grail in successful niche marketing is finding a niche that is driven primarily by emotion. There are very few niches where your potential customers are driven by emotions so intensely as in prepping and survivalism. So, HUGE demand, emotionally driven demand with buying customers who are prepared to spend, an extremely easy to reach target audience with losts of online activity ....means you can be one to survive and flourish. This is about as close to a “perfect” niche as you can get, it has all the elements you're looking for when searching for a profitable niche. What about the search numbers? Look at all those high volume keywords, a lot of them 'buying' keywords. As you can see, "Survival" related keywords have very high monthly searches with high competition, and high CPCs - a sure sign of profitability. 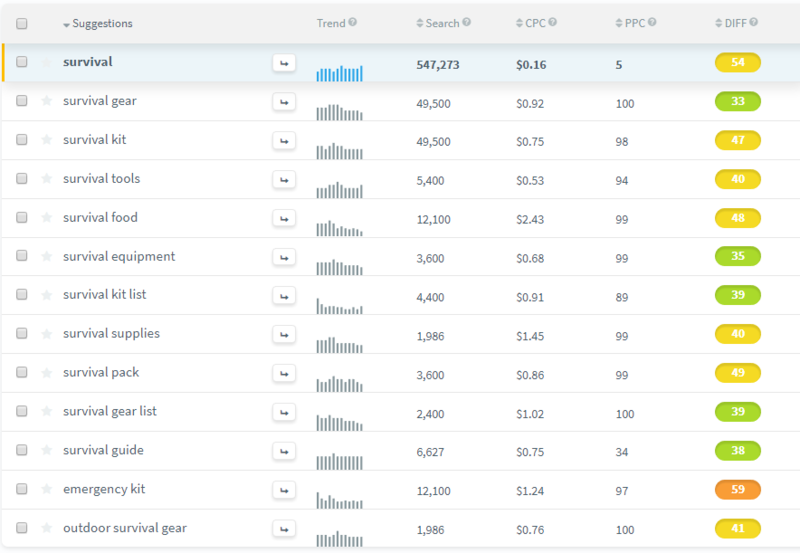 And this is just for keywords related to 'survival' - you'll get similar results for other common search terms in this niche like 'prepping' or 'homesteading'. And this is NOT just a flash in the pan. As you can see below, interest in survivalism has remained steady for years. There are spikes every time there is any volatility, whether it be political, or a natural disaster, or terrorism. Given what's happened around the world over the last year or two, this volatility is going to continue. This niche is hot, and demand is sky high. So you can see, the demand for survival information and supplies is huge... and the willingness to pay for it is there, making this a VERY lucrative niche. And that's why I've created this product... to make it INCREDIBLY simple for you to get started as an affiliate marketer in this INCREDIBLY hot niche. No matter what niche you are working in, you must build a list. 95% of the visitors you send to even the best converting affiliate offer will not buy first time. With the right traffic, and the right offer, a lot more WILL buy given time, but unless they are on your list, most likely it will be through someone else's link. Do not send traffic direct to an affiliate page - give them a reason to join your list first, THEN send them to the affiliate offer. First, this value must be given right away when you get the potential customer to join your list. So this means that you must offer a GREAT reason for them to give you their email - by giving them something they really want, something of true value that they would even be happy to pay for. A crappy ebook will just not cut it anymore. Once someone has joined your list, you'll start to send them emails, right? But always remember, it's not JUST you who'll be sending them emails - you and a thousand others. You know how busy your inbox is, all the junk that arrives there - your subscriber's inbox will be EXACTLY the same. How do you collect these subscribers? How do you set up a Squeeze Page? How can you create something valuable to give them, something that they'll really love? How do you write compelling emails, emails that they'll want to open? Well, that's where this offer comes in. I've created this product to make it INCREDIBLY simple for you to get started as an affiliate marketer in this INCREDIBLY hot niche - and more importantly, get started in the RIGHT way. 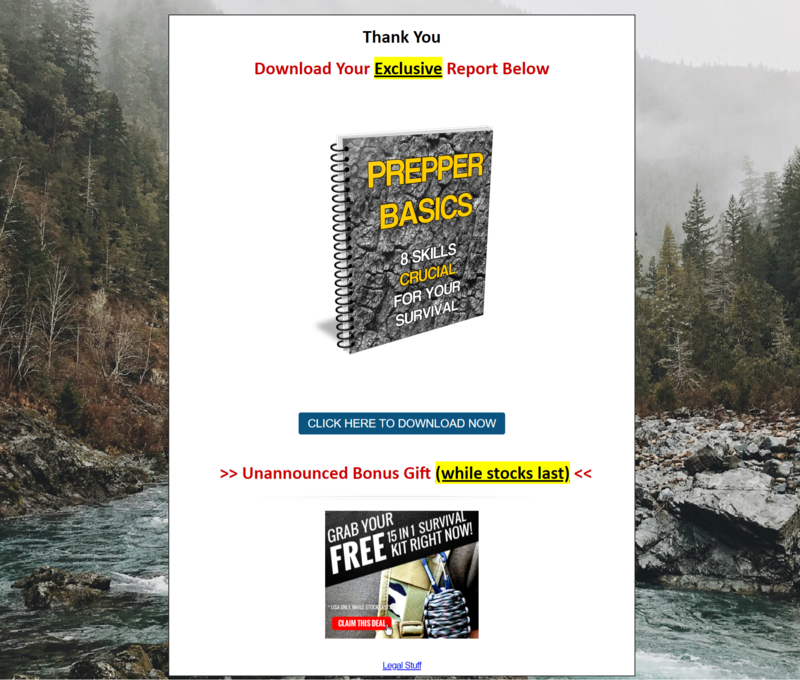 I have sourced a top quality report for you, ideal to use as a giveaway for your new subscribers keen to learn about prepping and survival. This report is professionally written, contains genuinely useful information, and is the perfect presell for the Clickbank survival product you will be promoting to your subscribers. Everytime someone clicks through and buys The Family Survival System (the main product being promoted), you will earn commissions - and not just once, but MONTH AFTER MONTH! You also get this high converting squeeze page - all you have to do is add your optin code & a few personal details, upload it to the net, and you're good to go! The reason you need to add the personal details is because it comes complete with ALL the legal pages you need - this is fully compliant. This is a modern, stylish squeeze page, fully mobile responsive with a 2 Step Optin - proven to increase conversions. You don't need any technical ability to edit these pages - you can do it all in a simple text editor like Notepad, and full instructions are included. Set this page as the "confirmation thank you page" in your autoresponder - this professional touch WILL improve conversions on your OTO. It informs the subscriber that they will get a download link for their free report sent to their email, and they are redirecting to a very special offer. That special offer will be through YOUR affiliate link. As with all the pages you're getting in this pack, it is really easy to edit this and add your link. And full instructions are included, so even if you're a total novice, this will NOT be a problem! You also get a professional download page for your new subscribers. All you have to do is add your affiliate link and upload the page to your server. The 'Unannounced Bonus Gift' is to a specially selected free survival kit offer on Clickbank. Because this is free you will have very high conversions, which is great for you - everyone who signs up will be automatically offered a whole host of upsells and cross promotions (including some recurring products). ALL sales made will be through YOUR Clickbank account! As well as creating a professional impression with your subscribers at this crucial stage in the relationship building process, you are also making sure that YOU will get credited for all future sales. Again, remember this includes recurring products - you will earn commissions not just once, but MONTH AFTER MONTH! This is the place where many affiliate marketers fall down - what to send to your new subscribers, and how to build that relationship of trust. Well, I've got you covered there too! You’ll be getting 7 high quality and high content survival autoresponder messages. With this superb content, you will look like a complete expert when it comes to prepping... even if you're not! Since the content is such high value, you’ll build trust with your subscribers, which means they will be SO much more likely to go with your recommendation. And even this is done for you - every email contains a link to the recommended product. The complete autoresponder series needs just need one simple 'Find & Replace' edit, and your affiliate link is there! This is for the same top survival Clickbank product as promoted in your free report. Remember the 95% who don't buy first time round? This means that you catch many, many more of these. Why not have the affiliate payments go into your Clickbank account, rather than someone else's? And remember, this is a membership product, earning you RECURRING income - make the sale once, get paid over and over again! These messages contain solid and very usable content that is sure to hook your subscribers and keeping them reading each and every email you send them. Your subscribers will be emailing you to thank you for the great content you're providing! Great... So, How Much Is All This Going To Cost? 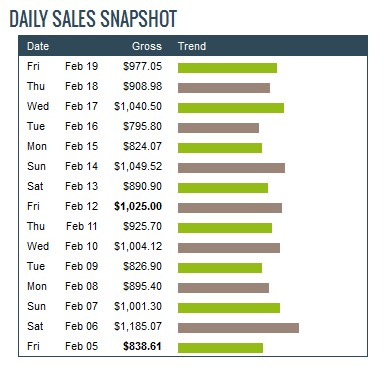 This sort of package in this massive niche, with quality giveaway, high converting squeeze page, and relationship building (and money making) email follow up messages could easily sell for $97 - and would still be awesome value. But I'm not going to change anywhere near this amount today. Because I know that once you're in the member's area and see the quality and value you're getting here, you'll not just buy once - you'll be a customer for life. By letting you have this for a fraction of it's true value, I will show you the quality of my products - and YOU will be my next repeat customer. 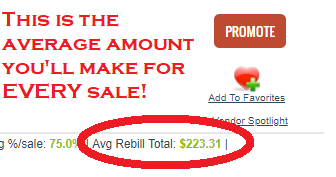 So click the button above, grab this deal, and cash in on this MASSIVE cash rich niche NOW! You will NOT get a better opportunity than this, at any price. Wouldn't I be better in a low competition niche? What a lot of affiliates don't understand is this... Competition is Good! Non competitive niches are non-competitive for a reason - there is no money to be made there. Many new affiliate marketers make the mistake of trying to find a new 'undiscovered' niche. But there's usually a reason it's undiscovered... because no-one's spending money there! You just need to set yourself apart from others, and the way you do this is really very simple. And that's exactly what YOU will be doing when you grab what I have for you here today. You will receive the high quality, professionally written survival tips report. The tips included in these are genunely valuable, making them the perfect way to get your relationship with your subscribers off to the perfect start. And because it is rebranded with your affiliate link, you can start earning right off the bat! With just a few minor edits, this is ready to upload to start building YOUR list. This is professionally designed and set up in a way proven to maximise conversions. All the legal pages are also included - making this fully compliant for any form of traffic. Improve your conversions and get extra sales with this professional redirect page - as soon as subscribers confirm their subscription, they will automatically be sent to the Clickbank offer through YOUR affiliate link. Create a great first impression with this professional download page - which in just a few clicks is also fully monetized with YOUR affiliate links. Delivered in a text file, with all the affiliate links already included, all you have to do is a quick 'Find and Replace', then copy and paste these content filled email messages into your autoresponder, and you're good to go. Imagine having your subscribers emailing you because they missed one of your emails! That's what happens when you send content this good. Never waste any of that traffic again! This is on a dime sale, so the price IS rising. Put simply, the sooner you get this, the less you pay. This is crazy value you're getting here... take advantage of this offer NOW before the price rises any further. Ok, that's it. I am not going to waste your time with pages of pushy sales copy. Especially not on something that is this good value. You know exactly what you’re getting. Something that will help you build a list in a very lucrative niche, and make you money. All the hard work is done for you. Grab it while it's still here! All I ask in return is that you actually use it – in the right hands, it is VERY valuable. 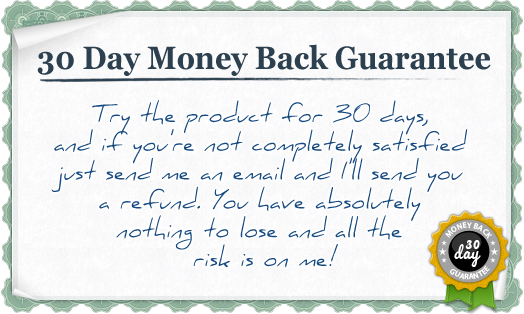 PS: Remember, with my 30 day guarantee, you've absolutely nothing to lose - all the risk is on me. Hit the Buy Button below, grab this NOW - when you come back, the price WILL be higher - and cash in on this MASSIVE niche starting today!